The birth of the base closely bound with the development of the activities of airlift carried out between Fairbanks and the Soviet Union from Ladd Field (today Fort Wainwright) in the middle of World War II. One of the great disadvantages that found the pilots who flew in the zone was the dense winter fog that often aborted the landing operations there. As most of the airplanes came from sites as far as Montana they arrived with low fuel remaining to reach the airfield of Big Delta used like alternative landing site in case of bad weather. 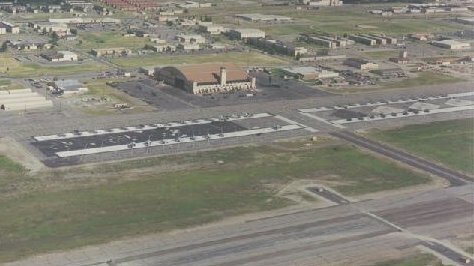 For that reason it was decided to construct south of Ladd Field a secondary airfield that was finished in 26 October of 1944 and named "26 mile strip". When the war come to an end, also finished the airlift with Russia and the military activity in Alaska descended steeply arising doubts on the future of the base. The beginning of the cold war and the advantageous position of Alaska in front of the potential Soviet threat forced the expansion of the airfield -renamed as Eielson Air Force Base- to allow to operate the bombers of the Strategic Air Command. This expansion included the construction of big (that could lodge up to two Convair B-36) and one of the longest runways in North America with 14,500 feet of length. Since then, it has been a key site for the activities of the Air Force in Alaska. In the field of the scientific ballooning the base served as remote detachments where operated the legendary Group 1110 of Balloon Activities assigned to Goodfellow AFB in San Angelo, Texas as of June of 1963 when was renamed 59th Squadron of Meteorological Reconnaissance. The continuity of the activity with balloons in the base had its origin in a sampling program called "Project ASHCAN" that was conducted by the Atomic Energy Commission to obtain samples of radioactive debris and pollutants in the atmosphere in several points in the entire world as a result of atomic tests and atomic powered satellites reentries. Every year from 1963 until 1980 were sent from Eilson AFB between 3 and 15 balloons wich gathered diverse samples for their later analysis and cataloguing. After the termination of the program in the 80's, the base will no longer be used for such activities.